Well its two years since Paris, and the Bonn climate conference is over, and the future looms. It’s a good time to stop and read the new report of the Civil Society Equity Coalition, which EcoEquity, a core member of the Climate Equity Reference Project, is extremely pleased to support. It’s a really short report, so you have time to do so. Read at least the summary, and don’t be put off by the report’s subtitle, which is “Towards a meaningful 2018 Facilitative Dialog.” The Facilitative Dialog is one of the “ambition mechanisms” that was created by the Paris Agreement, and we should all wish it the best. Dialog, after all, is fundamental to governance, and indeed to civilization. In the absence of a global state, we’re going to have to make the most of it, and of all the ambition mechanisms, if we’re going to have a real chance of stabilizing the climate system. Accepting the Intergovernmental Panel on Climate Change (IPCC) scenarios provide us with a global carbon budget that will be consumed in 10–20 years at current emissions levels, and entail very significant levels of risk. A commitment to keep at least within this limited budget, and to share the effort of doing so equitably and fairly, is at the heart of the international debate around climate change. As a result of agreeing the Paris Agreement in 2015, governments have put forward voluntary pledges starting in 2015 in the form of ‘Nationally Determined Contributions’ (NDCs). An updated analysis from a diverse and broad global mix of civil society organizations seeks to ascertain whether these pledges are ambitious enough and tolerably fair. 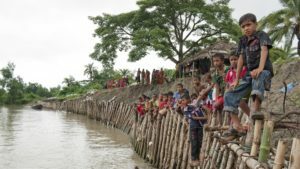 (By the way, the picture above is of a makeshift seawall in Patuakhali, Bangladesh, a region prone to frequent cyclones and devastating floods. It was taken by Brandon Wu of Action Aid).